Claymates is a charming, visually fun, but relatively mediocre platformer released in the 16 bit era “cartoon mascot” wars era. 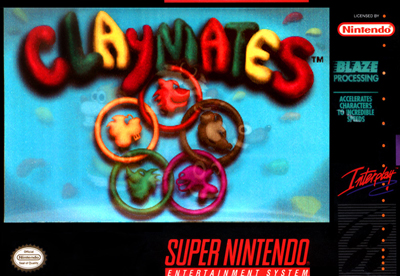 Interplay’s creation of this game followed in the footsteps of two early nineties’ crazes, in fact, by stylizing the world and characters of the game with claymation. We start our game off by finding out that Clayton’s(our protagonist) Father(a scientist), has developed a formula that turns clay into animals. A random witch doctor appears, demanding the formula. Upon Clayton the Sr.’s refusal, the witch doctor turns Clayton in a ball of clay, and thus our journey begins. We start off in Clayton’s yard, a rolling ball of clay that can punch to defend himself. You move relatively slow as the ball of clay, and one hit can kill you. When you are traversing the levels, you get random bits of gray formula that change you into different animals to help you overcome obstacles in the game. Your Claymates include a rat that runs fast a la Sonic and bites enemies, a cat that can climb vertical surfaces, a fish that spits...something, a squirrel that tosses nuts and jumps high, and a duck that flies. The biggest problem with this system is that it only gives you the animal you need at the exact moment, and designs the levels in such a manner that sometimes you are forced to take damage so you are back in ball of clay form. Level design is very reminiscent of Bubsy, so expect a lot of up and down while traveling left to right, with some odd backtracking thrown in to climb high enough to continue along. The game is basically a collect-fest while moving from one location to the next, and after a few levels in each of five areas you are treated(?) to a boss fight to kind of break up the monotony. One big drawback of the game is there is no saving, and no passwords-so it is a sit down and play for a day game, but is thankfully only about 2-3 hours long, although I imagine you could get through the game in an hour if you were overly familiar with it. Again, this game isn’t a letdown, but you definitely would have been more excited about this as a rental or borrowing it from a friend than as something you had to buy. I think the game could have found it’s footing better had the developers allowed you to collect the Claymates as you went and then been able to switch into them at will. Then, maybe the game would encourage you to explore every area of the stages and allowed some moments of pause while you contemplated the best way to overcome an obstacle instead of being given a solution right before the problem arises.